A wounded soldier being treated by a dental surgeon. No.1 New Zealand General Hospital, Brockenhurst, England. 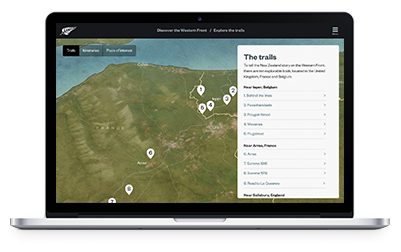 The First World War saw technology advance rapidly, as each side rushed to find more efficient and effective ways to inflict damage. As a result, a simultaneous race began to develop better ways to heal and repair. It was discovered at the start of the war that wounds healed better if they were operated on as quickly as possible, left open to drain and flushed with antiseptics. Antibiotics weren’t yet discovered, so infected wounds were cleaned with chemicals such as chlorine. Later the ‘Carrel-Dakins’ method was developed, where wounds were continuously flushed with solutions of hypochlorites and boric acid. Soldiers with wounds that had once been highly likely to be fatal, such as abdominal wounds, eventually had a 50% chance of survival. Also taking place was pioneering work on treating facial injuries, leading to what is now known as plastic surgery and maxillofacial surgery. New Zealanders were at the forefront of this. 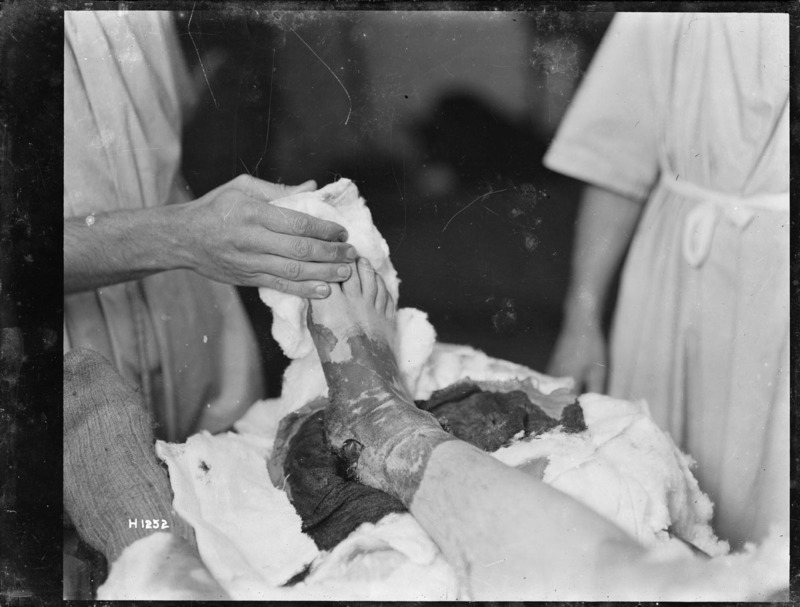 A photograph of a soldier's ankle wound, taken at a 2nd New Zealand Field Ambulance medical station. At No. 2 New Zealand General Hospital in Walton-on-Thames, surgeon Henry Pickerill established a special unit for treating facial and jaw injuries. He helped develop new techniques of tissue transfer, new forms of anaesthesia and better hygiene standards. Meanwhile, based at Cambridge Military Hospital in Aldershot, New Zealand-born doctor Harold Gillies developed techniques using tubes of live skin that increased blood supply to skin grafts. Other work took place around disease prevention. In the filthy conditions of war, outbreaks of disease could devastate armies. So by 1914, the British Army had developed strict hygiene guidelines, along with ensuring that troops were vaccinated against typhoid and cholera. Historian Gareth Phipps explains some of the advances in medicine during the First World War. "Medical practices advanced significantly during the First World War. One of the big areas of improvement was wound sterilisation. Techniques like the Carrel-Dakin method of irrigating wounds with antiseptics and better bandaging materials, improved recovery rates, especially leg, arm, and head injuries. Significant progress was made in the treatment of shock – by 1918 Allied doctors were performing blood transfusions, and establishing blood banks near the front line. "There were huge advances in the field of plastic surgery, with New Zealand surgeons Harold Gillies and Henry Pickerill leading the way in facial surgery and burns treatment. Gillies used tubes of live skin to increase blood flow to skin grafts, while Pickerill developed new tissue transfer and anaesthetic methods. Much of this pioneering work took place at a New Zealand facial plastic surgery department, established in England in 1917. "Military medical services became better organised in looking after the wounded as the war progressed. There were fewer delays in administrating potentially life-saving treatment, with surgeons moved closer to the frontline and hospital trains used to evacuate casualties. Soldiers with wounds that would have been fatal were now more likely to survive." 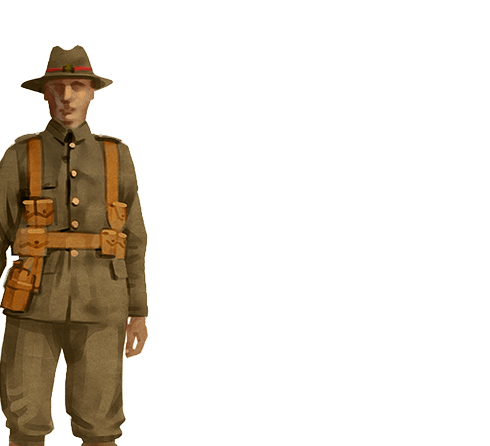 In early 1916, the New Zealand Division established its own sanitary department which provided services such as clean water, rubbish collection, safe food storage and preparation, clean bathroom and toilet facilities, and sterilisation treatments to keep lice at bay. Because of improved practices like these, this became the first major war where most soldiers’ deaths weren’t caused by disease.